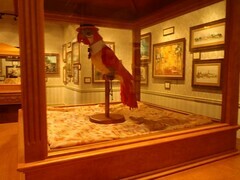 The Disney Gallery is located next to The Disneyland Story and Great Moments with Mr. Lincoln exhibit/show area on Main Street. It is partly a store, as most of it is artwork for sale, but it also is a themed exhibit. 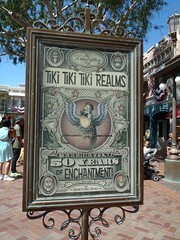 The current exhibit called “Tiki Tiki Realms: Celebrating 50 Years of Enchantment,” which is about the Tiki Tiki Room attraction. Mik enjoyed rolling around and viewing the different artwork and seeing the animatronics up close. Of course, his favorite, though, was the miniature collectibles they sell in the shop.